Since 2012, Kocarek GmbH has been a SILVER Sponsor supporting the non-profit organisation Translators without Borders. Translators without Borders (TWB) is a non-profit organisation founded in 1993 in France under the name of “Traducteurs sans frontières” by the Canadian Lori Thicke and the English Ros Smith-Thomas. Today, Danbury, Connecticut, USA, is home to the organisation’s head office. The aim of this organisation is to provide more people worldwide access to vital information. With the dedicated support of voluntary translators from all over the world this project can succeed. In this way, approved non-governmental organisations (NGOs) such as Médecins Sans Frontières (Doctors Without Borders), Action Against Hunger, Oxfam US and Handicap International are able to translate more than two million words per year. Despite strong support from around the world, this is not even one percent of the translations needed – more than a thousand organisations urgently require help in local communication. Translators without Borders hopes to reach at least ten million translated words per year with the help of an open digital platform and the establishment of an organisational structure. Especially in developing countries, people are excluded from vital information due to language barriers. By providing translations, the organisation Translators without Borders tries to fix this communication problem. This transfer of knowledge often fails at the very beginning of the information chain. In developing countries, most people solely speak their own regional language and only a few doctors speak enough English to get the crucial information, not to mention the nurses or other medical staff. That is the reason why even in African countries with English as one of the official languages, the transfer of knowledge concerning health cannot be secured. In consequence many children die due to this lack of information. Often parents don’t even let their children see a doctor, because they neither understand the information concerning health nor understand the seriousness of the situation. Some of the world’s greatest problems – such as hunger, help after natural disasters, nutrition and education – can be solved by providing information in local languages. Getting information in the own language is the key to survival. According to UNICEF, more people are still dying today from lack of basic knowledge than from disease. Translators without Borders supports people in poor countries by making information relating to health and education available in local languages. This is primarily achieved through the provision of translations by voluntary translators to various humanitarian organisations. 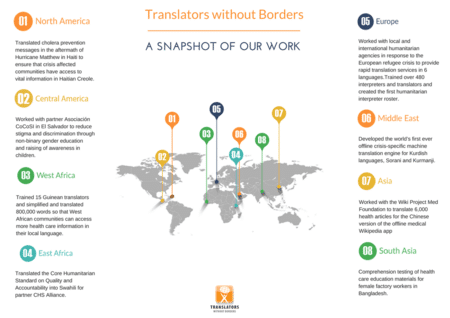 Through the years, Translators without Borders succeeded to establish a community, that supports non-governmental and humanitarian organisations in providing their aid workers with crucial information in local languages, quickly and unbureaucratically. Humanitarian organisations are able to work directly with professional and experienced translators via an online-platform and thus receive always high quality translations. For millions of people language is the only barrier, preventing them from learning essential information. Hence the mission of this non-profit organisation is: “Translating for Humanity”. As a Silver Sponsor of Translators without Borders we are proud of being able to make an important contribution to global communication in the fight against vital knowledge gaps. How can we help? Contact us – we will be happy to advise you! We will give you a free quotation, with no obligation on your part. Simply send us the text, or a description of the service required. Are your files too large to send by email? Then you will get access to the secure in-house Kocarek Cloud. We are certified under the international standard for translation services ISO 17100. We are certified under the international quality management standard ISO 9001.